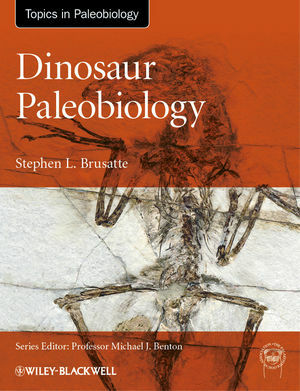 It finally arrived via Amazon: Steve Brusatte’s new book Dinosaur Paleobiology! Yay! I’ve known about the book for a while, ever since Steve contacted me about using some illustrations from my papers for it. And I’ve been looking forward to it for two simple reasons: 1) Steve is a smart guy and can write, so I expected the book to be well-written and comprehensive, and 2) it was obvious that my research would feature favorably in it. And admittedly, my research can use some more publicity. So when the book finally came out now, I immediately ordered it – the paperback version, that is (cheapskate that I am). At just over € 40.- the book has a very reasonable price, whereas ~€ 112.- for the bound version is not a sum a student will happily part with, nor I. The book appears in the Topics in Paleobiology Series, published in collaboration with the Palaeontological Association (and don’t you love the abbreviation “PalAss”?) and edited by Mike Benton of the University of Bristol. I couldn’t get any hits except for Steve’s book when I searched the Wiley site, so I expect it is the first in that series. btw, you can see a preview on the Wiley site, and on Amazon. I stole the image of the cover from there. To summarize, the book has ten chapters, 261 pages without references and index and 322 with them, 16 color plates and many b&w figures (did you really think I’d count them???). But what do these pages hold? I haven’t read it all, obviously, as the book only arrived today (EDIT May 14: in fact, it arrived quite a while ago by now, this review was delayed by technical problems). I must admit that so far I haven’t even read 10% (EDIT May 14: 50% by now). But I have – naturally – read the parts that deal with my own research, and those covering my areas of expertise. And a bit more….. see below. I have also skimmed and (part-)read some chapters, including the first “An Introduction to Dinosaurs“, and taken a look at all the illustrations. Therefore, I feel that I can judge the quality of the book based on a representative sample. Don’t come blaming me, though, when some obscure remark on ornithischian palaeobiology is wrong. While the book is clearly aimed at providing an overview and starting point for literature research on dinosaurs to students, interested laypeople and professions from other fields, Steve’s intended audience clearly is one that does not shy away from technical terms or complicated issues. If you think every issue in the world is black or white, this book is not for you. If, on the other hand, you are interested in getting a great overview of the state of the art regarding dinosaurs and how they lived, then Dinosaur Paleobiology is an excellent and fun way to get it! And, admittedly, even dinosaur experts have a few – uhm, let me call them “blind spots”. Areas where we just have no clue whatsoever. And this book is just what I need to get me started on filling them. Steve manages to introduce each chapter with an easily accessible page of text detailing what the chapter is about, and why the information is important. This text allows laypeople an easy entry, and Steve also adopted a more conversational tone for the introductory chapters. Let’s look at what’s in these chapters. Dinosaur Paleobiology starts out with classic palaeo: hard tissues, soft tissues, phylogeny – those are chapter titles. And Steve delivers what the titles promise: a solid overview, focused on the topic. Too often such overviews are too short, more of a cursory “throw data at the reader and let’s be done with it” in a book that really aims to teach you about something else. Not here – this book was explicitly written to give an overview of the basics, and thus there is enough room to go into sufficient detail and not ignore the odds and ends. Also, Steve repeats important issues, so that they sink in even if the topic’s width means the reader is flooded with information. On the other hand, Steve did not fall for the all-inclusive trap: he generalizes smartly, so that the text does not bog down in technical details of some weird derived sideline of mysterious and poorly known ornithischians. Also, Steve does not waste any ink on “what we used to think” and on fringe opinions. That’s not what the book is for, and Steve knows exactly where to draw the line. Thus, no BANDits, for example. One chapter where it becomes especially obvious that Steve can write is the descriptive part about the skull. Steve goes through all the usual sections of the skull, braincase, skull roof, palate, etc., listing and generally describing the shapes of the bones, and how they are arranged. In typical text books, this is the section that makes my mind blank out: dry. filled with jargon and little asides on (totally irrelevant) exceptions. Steve instead makes it a well-readable text, by the simple expedient of adding short remarks on the functions of the bones, e.g., which bones are the typical attachment sites for important muscles and so on. That and the relaxed tone allow me to soak up information instead of forcing it into my aching brain. Well done! A very interesting chapter is “Form” – bauplan and how you study it, etc. This is where a lot of the digital techniques are described, and as elsewhere Steve does an excellent job of summarizing the state of the art in a neat and accessible way. “Locomotion and Posture” is very good as well, but lacks (for the obvious reason that I haven’t formally published it yet) reference to my Speedwalking Dinosaurs hypothesis. The next chapter deals with dinosaur fodder, others with physiology, growth and so on. All these chapters highlight the work by the Sauropod Research Unit FOR 533 whenever sauropods come up, but the “Neck Wars” (see SVPOW for an example), and a LOT of very important stuff done by John of the Freezers Hutchinson are also there. And much much more! With regards to physiology and in the final chapter on extinction Steve manages to present the highly controversial topics well, the evidence provided by all sides (as opposed to the BADNits with their lack of evidence; they get ignored), then finally sticks his neck out by hanging his hat on an option. Dinosaurs were, Steve concludes, what I term “functional endotherms”, whatever the details and tiny differences from birds and mammals, and were killed off either directly and indirectly by the asteroid hit, or with ample help from it.I applaud Steve’s decision to not sit on the fence out of a misguided sense of having to report evenly or some such nonsense. The evidence is clearly not evenly supportive of hypotheses, and Steve does a very good job of showing why that is the case. For a scientist that may not be necessary, but many laypeople will read this book, too. Many books with a similar scope and intent as Dinosaur Paleobiology do not use in-text citations. Instead, they give a list of important sources and recommended reading at the end of each chapter. Dinosaur Paleobiology instead gives sources for all statements that require them (i.e., the fact that earth exists is not sourced). And Steve has done an admirable job with what he cites! First off, he managed to cite seminal works for the big breakthroughs, so that the reader can easily find where an idea came from, and gets to know the important names, the famous giants of our profession. In addition, Steve cites recent works that summarize, provide overviews, define and describe methods and terminology – in essence, the best places to start a study of a particular subject. But Steve goes beyond that, and in various places in the book explicitly calls out important works as fundamental to certain theories or fields of knowledges -he gives concise reading lists. Overall, when I combed the book’s references section, I found all the papers that are “must-cite”, many that are extremely helpful for “getting started”, and as I mentioned: oh joy – no BANDits! And the list is remarkably up to date, too! Our FOR 533 book on sauropod gigantism didn’t make it in, but a lot of literature of the last two years is cited. In all there are five plates showing dinosaur art, one in which an artsy ontogenetic series of Tyrannosaurus life reconstructions is shown – but mind you, all these figures are great art, not some BS -, seven plates showing real fossils, one of them with histological sections of dinosaur bones, and three (count them, three!) with digital models. Nice balance – I’ll have more to say on how balanced this book is below. And the print quality is excellent, so that even the tiny plates are helpful. Together, they give a nice overview of dinosaur research: old bones, modern methods, with the aim to give us enough information to make the animals come alive at least via artwork. Additionally, many figures were created specifically for the book. Most importantly, instead of relying on questionable older ones, a gazillion brand-new skeletal reconstruction drawings were made by none other than the Master and “go-to” guy for them, Scott Hartman! (check out Scott’s blog skeletaldrawing) They are similar to the famous (or should I by now say infamous?) Greg Paul style, but I have yet to catch Scott messing up proportions or bone shapes. One of them (4.17, p. 107), my absolute favorite, compares Plateosaurus (yeah, yeah, you knew this was coming) and Melanorosaurus, a perfect way to illustrate how a bunch of small differences in proportion account for the wide variety of locomotion modes we see in “prosauropods”. As I mentioned in passing, the book is not perfect. The text isn’t, the figures aren’t. However, perfect is not only the enemy of good enough, it is also the enemy of getting it done and published! To express it in another way: there is a ternary diagram, with the corners “linguistically perfect”, “didactically perfect” and “up-to-date”. Others exist for color figure “size”, “number” and “quality”, for “length”, “accuracy” and “up-to-date”, and so on. So the b&w figures are not perfect, not the most beautiful possible example, but just good-enough to show what’s needed. As this book is not intended as a coffee table book, or even a resource for teaching, that’s the perfect choice: get what you can as good as you can, but don’t waste time and delay the book just to get it nice! That’d be like having a road map come out a decade late, but printed glossy, instead of ASAP and on normal paper. Overall, Steve did the right thing! Similarly, the balance on book length and detail is very good. Obviously, I’d like to see even more biomech in it, but to be honest the book does give an overview of what’s on, and where to find it. Few and far between – but there still are some things not mentioned so far I would like to point out that could have been improved with little work. In some figures taken from other publications abbreviations are used that are not explained. If the papers in question were all open-access that would not be too bad – after all Steve aims to open doors into reading the scientific literature, not write a textbook. But some of the papers are, IIRC, only available for-pay, and thus not very accessible for laypeople. Adding a list of what the abbreviations mean would have been a great idea. Similarly, sometimes the text could have profited from giving it to a total dino noob for proofing. As I said it is a matter of balance how much you fiddle with the text to get it perfect, so I won’t whine too much here. Let me only say that sometimes, a clarification in parentheses would have been helpful for laypeople. Overall, however, the text only requires a more careful reading in a few cases, and that’s all. If you’re into dinosaurs, Buy This Book! ’nuff said! If you want to learn about dinosaurs, the scientific literature does not offer easy access. This book does, and gives you the info that helps accessing the scientific literature you need. For once, the blurb is right on target – so why should I bother re-writing it? This entry was posted in Books, Dinosauria, reviews. Bookmark the permalink. While I haven’t read as much of it as you have (Off the top of my head, Chapter 3, 4 & 7), I have noticed some of the same things. While that seems to be the case for the most part based on what I’ve read, there are some parts in which it isn’t. E.g. In Chapter 7, Steve completely supports Wings & Sander 2007 while completely ignoring the evidence for sauropod gastroliths that does still exist (“Nevertheless, occasional sauropod skeletons do show appropriately sized cobbles within the rib cage, suggesting that rock-filled gizzards may have been part of the digestive solution for at least some of these dinosaurian giants”: http://www.amazon.com/Dinosaur-Odyssey-Fossil-Threads-Life/dp/0520269896/ref=ntt_at_ep_dpt_1 ). Thank you! If there’s 1 thing that annoys me about some paleontologists, it’s that they’re too conservative when it comes to issues such as those (“Discovering Dinosaurs: in the American Museum of Natural History” is a good example of this, although it is pretty good overall). you’re welcome – I feel the very same frustration you do when I see those “anything is possible, maybe maybe” exhibitons and books. The point made by Wings and Sander is that the existence of a handful of pebbles, whatever size they have, shows that there was no gastric mill. You’d need to find a total critical amount, and you’d need to find appropriately sized, shaped and textured pebbles to have any sort of evidence. And that’s not been found in nay sauropod, but has been found in, e.g., many psittacosaurs. 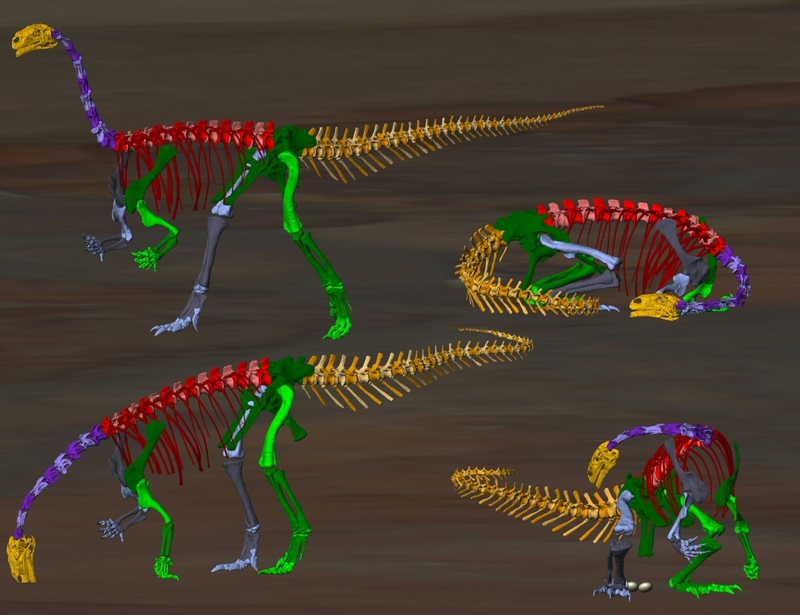 Therefore, I think Scott Sampson is simply wrong, or overly cautious, by still “allowing” gastric mills in sauropods. To make sure I don’t misinterpret the quote you gave, I’ll get this book from our lib and have a look – can you provide me with the exact page, please? Sure. IIRC, the quote’s from page 219. Right b-4 the quote, Sampson discussed the evidence against sauropod gastroliths, hence the “Nevertheless”. I figured that’s why it still comes up in technical dino books (E.g. “Transylvanian Dinosaurs”, page 30). P.S. Something I forgot to mention in my previous reply: As Michael O. Erickson & William Miller pointed out (See the comments section: http://svpow.com/2009/12/02/your-cervical-ribs-are-probably-non-existent/ ), Wings’ analysis is majorly flawed in that it compares sauropod gastroliths to ostrich gastroliths while completely ignoring moa gastroliths (which are much better analogues). Many thanks in advance for reading my replies to your blog posts.